Steroid injections are an integral part of conservative, non-surgical treatment methods used by pain management specialists to relieve pain and inflammation in the body. The first recorded use of corticosteroid injections dates back to 1952 when they were used to treat lumbar spine disorders. Steroid injections have grown in popularity to treat pain and inflammation in the muscles and joints. The injections form a complement to other conservative therapies such as medication and physical therapy. What are Steroid Injections Used to Treat? 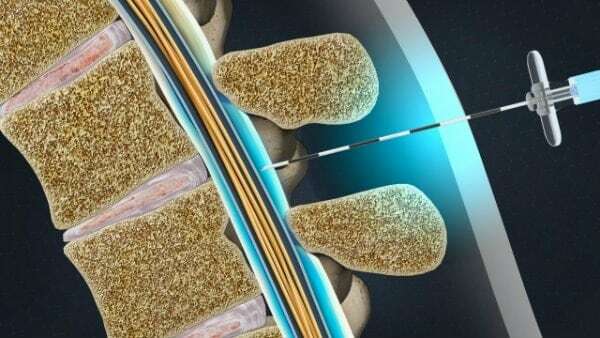 A rendering of an epidural steroid needle injection. Steroid injections are often used to treat a concentrated area of the body, such as in the pain and swelling of a specific joint or tendon in the knee, hip, elbow, or shoulder. They can also be administered to alleviate systemic inflammation throughout the body as in the case of an allergic reaction, rheumatoid arthritis, or asthma. The calculated use of steroid injections combined with a well-designed rehabilitation program can provide an effective way for patients to reduce inflammation and promote healing. The decision to administer steroid injection is made by patient and doctor on a case by case basis. Your physician will look at your age, physical fitness, and other prescribed medicines being taken, and ensure that you are fully informed about the potential advantages and risks that a steroid injection may entail. “Steroid injections don’t necessarily work all the time in all patients, but your doctor will decide with you whether or not a steroid injection may be right for treatment of your pain problem,” says Dr. Frohwein. Possible side effects of steroid injections include but are not limited to: injection site pain, anxiety, facial flushing, high blood sugar and insomnia. Occasionally you may experience a headache which should go away within 24 hours. Some patients are allergic to the medication. If you develop itching or hives contact our office as soon as possible. Other rare side effects include difficulty breathing or swelling of your face, lips, tongue or throat. If these happen call 911. Steroid injections are used carefully due to their ability to cause systemic side effects. Long term effects can include easy bruising, weight gain, mood swings, blurred vision, lower resistance to infection, puffy face and muscle weakness.